> Electric motors and starters>Single-phase electric motors medium and high starting torque. In this section, adajusa.com offers a wide variety of single-phase and high-torque electric motors for you to acquire just the one you need. 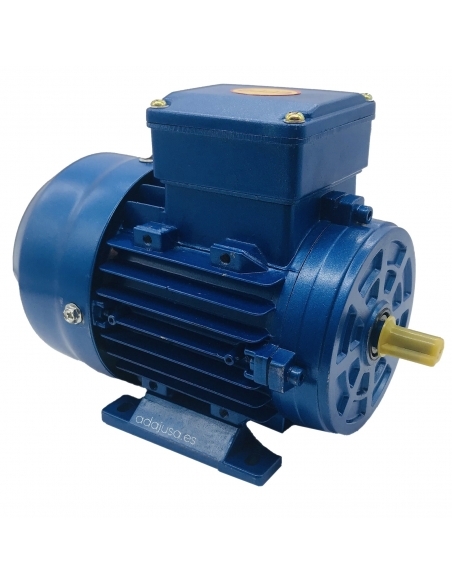 The single-phase electric motors you will find here are suitable for flanges type B3, B5 and B14 and have an oil seal on the output shaft and a rear cover to prevent the entry of foreign particles, water, oil or dust inside the motor. Its degree of protection is IP-55 and its insulation is class F-EFF2. These single-phase electric motors come completely closed and have external ventilation. Its working voltage is 230V. Do not hesitate, the engine you need has it here and at a surprising price. Single-phase electric motors with half starting torque, flanges type B3 (foot) B5 and B14. Oil retention on the output shaft and rear cover-shield to prevent the entry of dust, water, oil or foreign particles inside the motor. Half starting torque. - IP55 Completely closed. - Ventilation: Exterior. - Class F insulation - EFF2 - Voltage: 230V 50Hz. - Revolutions: 3000 rpm. Single-phase electric motors of high starting torque with centrifugal circuit breaker, flanges type B3 (foot) B5 and B14. Oil retention on the output shaft and rear cover-shield to prevent the entry of dust, water, oil or foreign particles inside the motor. High starting torque with centrifugal circuit breaker. - IP55 Completely closed. - Ventilation: Exterior. - Class F insulation - EFF2 - Voltage: 230V. 50Hz. - Revolutions: 1500 rpm. Single-phase electric motors with high starting torque with centrifugal circuit breaker, type B3 flanges (legs) B5 and B14. Oil retention on the output shaft and rear cover-shield to prevent the entry of dust, water, oil or foreign particles inside the motor. High starting torque with centrifugal circuit breaker. - IP55 Completely closed. - Ventilation: Exterior. - Class F insulation - EFF2 - Voltage: 230V. 50Hz. - Revolutions: 1000 rpm.